Recurring payment and shipment every month, cancel anytime by logging in. Don't love it? Return it for a full refund within 30 days. Energize & Recharge Your Cells! No Maltodextrin or Added Sugar! Convenient Packets to Carry Around! Check out these minerals in 1 scoop: 1000 mg of potassium, 75 mg of calcium, 120 mg of magnesium, 15 mg of chloride, 10 mg of sodium and 100 mg of trace minerals. But the best part about this complex is there is NO maltodextrin or sugar – it’s just straight electrolytes in a lemon raspberry flavor with a touch of stevia. SIDE NOTE ON MALTODEXTRIN: Manufacturers use maltodextrin as a food additive, a thickener; basically it is a filler so companies can increase the volume. It can spike your blood sugars due to the high glycemic rating. Maltodextrin is a white powder made from corn, rice, potato starch, or wheat. However, maltodextrin’s glycemic index is higher than table sugar, ranging from 106 to 136. This means that it can raise your blood sugar level very quickly. 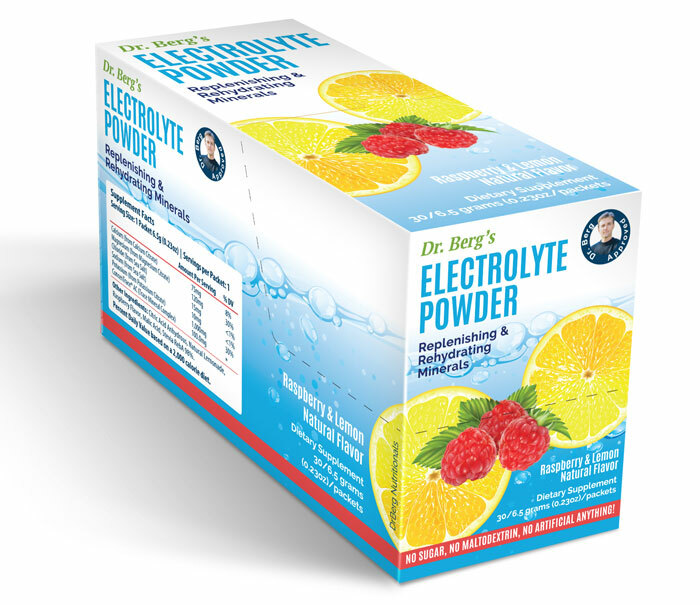 Dr. Berg’s Electrolytes has the most potassium of any electrolyte power mix! Disclaimer: The dietary and other substances, and/or materials, equipment or devices discussed on this site may not have undergone evaluation and/or testing by the United States Food and Drug Administration or like agency of any other country. Risks that might be determined by such testing are unknown. Click here to read the full disclaimer text. These statements have not been evaluated by the FDA. This product is not intended to diagnose, treat, cure or prevent any disease. Information on this site is provided for informational purposes only, it is not meant to substitute medical advice provided by your physician or any other medical professional. You should not use the information contained on this site for diagnosing or treating a health problem, disease, or prescribing any medication. Please read product label before use. Best results are only achieved when combined with diet and exercise program. Results not typical for any or all claims.